Okay, I’m not physically in Finland yet, but mentally . . . ? Learn about elder care in Finland. 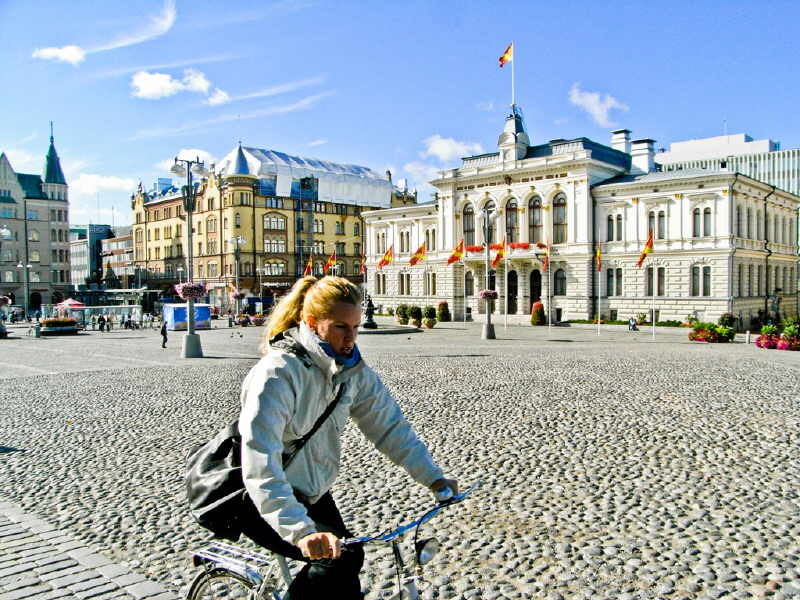 As a reminder, I am comparing elder care in Finland, Estonia, Romania (a new addition! ), and the United States. My questions and focus have evolved over the semester. (Reading and thinking and talking to people does that). I’m still interested in workforce issues and how each country is preparing for the impending shortage in health care and social service professionals prepared to work with older adults. But, much of that information I can gather from existing sources. The added value of talking to actual people is that I can learn about their experiences on the ground. So in each country I want to talk to service providers, older adults, and informal caregivers about their experiences with elder care. Why? There is evidence that different health care and social service systems lead to different population-level results. But what about the lived experience of those receiving those services? Do older adults, caregivers, and service providers have a different experience in Finland than they do in the United States? And, if yes, what are those differences and where do they come from? I don’t expect to answer these questions over the next seven weeks, but I hope to talk to as many people as possible to get the ball rolling. Here’s where the crowd sourcing part comes in. First, if you know someone in Finland I should talk to – who works in elder care, an older adult receiving care, a family member or friend helping an older adult – let me know (in other countries too, but I may not get to them this time around). I will ask an hour of their time tops, with the actual interview lasting 30-40 minutes. Second, if you could ask them anything you wanted, what would you ask about their experience? Here are my initial questions. All you thoughtful, curious readers, feel free to edit, delete, add, or otherwise share your thoughts. Please describe the structure and services of this office. Please describe your role as a [position title] within this office. Please describe a typical day (or yesterday or one day last week). Who did you see? How many did you see? What did you do with them? What types of services are you receiving currently? What led you to seek help? When was the last time you received services? What do you like about the services you receive? Thank you to the American Scandinavian Foundation for supporting this research. In one of my very first blog posts, I wrote about the 2015 White House Conference on Aging (WHCoA) and shared my post to the WHCoA website about geriatric workforce development. One comment I received from that post was about the importance of support for informal caregivers. The importance of informal caregivers to long-term care should not be overlooked. In fact, in response to this comment, I’ve incorporated more about informal care into the current cross-country comparative work I’m doing. Since I wrote that post, The Gerontologist has published a special issue dedicated to the WHCoA. Three of the articles in this issue talk about informal caregivers and their importance to long-term care. Here is some of what I took from these articles. Long-term care combines room and board, personal care, and medical care. That leaves a lot of room for interpretation and innovation in terms of how those pieces are put together. The current long-term care system has been cobbled together over time. Changes have often been made in response to scandals, resulting in a lot of focus on safety rules and regulations and less on the things that people say they actually want in long-term care – as much autonomy as possible and a good quality of life. In the interest of safety, we have taken away the ability of frail older adults to take informed risks about how much and what kind of care they want. We have focused on more training for professional service providers rather than considering how the current workforce could be used more effectively. The system needs to be redesigned, but to do that we need to give up some of the focus on regulation and move toward an outcome-based approach that rewards more than it punishes. Informal caregivers are key to this system. Without them long-term care would cost a lot more, but their contributions, and the significant financial burden informal caregivers bear, is not fully appreciated. Caregivers spend on average around $5,500 annually out-of-pocket providing care and lose some or all of their income from paid employment and future Social Security benefits because they work fewer hours. With an aging population and fewer family caregivers available because of smaller families and more two-income households the need to support the informal caregivers who are available is that much more urgent. The current move in health care toward more “patient-centered care” is important. But patients aren’t receiving care in a vacuum. Sometimes the focus on the patient does not “properly engage, educate, or support family caregivers or other informal care providers”. Furthermore, the prevailing view is that being an informal caregiver is chronically stressful, bad for your health, and generally a negative experience. In this climate, how do we best support caregivers to do this important work? Roth et al suggest that a more balanced view of the caregiving role may encourage more people to become caregivers and can help us better target services and supports to those caregivers who are most in need. To do this, they review a number of existing, population-based studies focusing on increased risk for mortality among family caregivers. The bottom line is that not all caregivers report significant strain from providing care and those caregivers are at no greater risk of mortality four years later than those who are not caregivers. Furthermore, five population-based studies found that, in general, caregivers had significantly reduced mortality rates compared to non-caregivers. Although, I think this study suffers from some of the same problems they cite in previous studies, the authors’ point is well-taken. Taking a one-sided negative view of the effects of caregiving does not show the whole picture and existing research does not consistently or sufficiently control for confounding factors (such as evidence that older adults who become caregivers are healthier than same-aged non-caregivers). Viewing caregivers as resilient and capable as opposed to at-risk resonates well with the strengths-based approach of social work. Furthermore they can be seen as a resource. So, if the notion of patient-centered care is expanded to include whoever the patient identifies as informal caregivers (moving away from our narrow definitions of what constitutes family and who can be designated as a caregiver) and (this is key) there is reimbursement for caregiver interactions, then health care professionals might communicate with them more effectively, incorporate them more effectively into health care decisions, and make resources available to support them, including initial and follow-up assessment of caregiver needs along with patient assessments. In terms of support, respite care is one of the most commonly requested types of caregiver assistance. It is important for reducing or delaying burnout and institutionalization. However, it is not always available and, when it is, eligibility is often tied to the health of the care recipient, not the caregiver. Often by the time caregivers receive respite services it is late in the process and they are in crisis. This defeats the prevention goals of respite. The U.S. is behind other OECD countries in making respite care services available nationwide, although there are efforts in a variety of states. Oklahoma has taken a lead in respite care programs. In addition, in May 2014 they passed the CARE ACT that requires hospitals and care facilities to formally acknowledge and directly involve family caregivers in developing care plans. Other legislation around the country is trying to establish paid family leave, tax credits for caregiving, and other initiatives to support informal caregivers all of which are in line with national models in other countries. Caregivers need both financial and supportive help. They need better tools and training. They should be paid for the care they provide and the wages they lose either directly or through cash benefits that go to the care recipient who then chooses who they pay for care. Family care should count as part of the initial care expended to establish eligibility for coverage of long-term care services. $15 million dollars for a Family Support Initiative to ensure “the optimal deployment of public and private resources at the State and community level to assist family members supporting older adults and/or people with disabilities across the lifespan.” I confess, I don’t exactly know what that means. $50 million in new resources for existing aging programs that provide support such as respite and transportation. The Paid Leave Partnership that would pay up to half of the benefits and all startup costs associated with creating a paid leave program in up to five states. The grants can be used to cover family, parental and/or medical leave programs that provide up to 12 weeks of benefits. The State Paid Leave Fund that will provide technical assistance and support to States that are building the infrastructure to launch paid leave programs in the future. Currently only three states offer paid leave programs.